Apple is one the strongest brands on the planet. But over the past two years it has been increasingly tested by direct attacks from competitor advertising in its home market of the United States. This post outlines what’s been happening and Apple’s response to it. To put recent events in context, it’s worth quickly reviewing what Apple is about and how its U.S. advertising has helped to get it there. (Those familiar with Apple’s communications may want to skip over this). Essentially the strength of the brand has been its ability to combine the functional performance of consistently superior, product innovation with emotional rewards and social values that people want to identify with. It ticks every brand equity box. Ironically – given that Apple is now one of the world’s largest companies – it has often built these credentials by being a challenger brand. Through the years its advertising has pointed out its virtues compared to bigger, more conservative ‘enemies’. In the 1980s this enemy was IBM, as epitomised by the legendary 1984 commercial. In the 1990s it was Microsoft. More specifically it was a conformist consumer mindset that defaulted towards choosing a Windows-based PC. Apple’s response was the Think Different campaign. In the 2000s Apple more overtly targeted Microsoft with the Get a Mac campaign (which ran internationally, including in Australia and New Zealand). 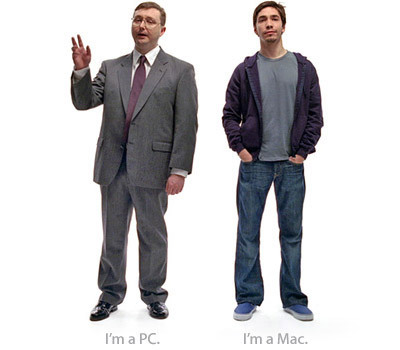 The “Hello, I’m a Mac” and “And I’m a PC” ads brilliantly personified the brand and its cool, capable user imagery while trying to stereotype Microsoft Windows and its users as inadequate nerds. Now Apple’s rivals are trying to use similar attack tactics against it. This opportunity has been created by Apple’s dominant position in smartphones and tablets. While its niche position in personal computers (around 5% of global PC sales) has to date allowed it to take a challenger stance, it’s become the gorilla in the room in mobile devices. Apple is now fair game for small and large competitors alike. Samsung has led the charge on this starting with its 2011 television commercial for the Galaxy S2 smartphone. 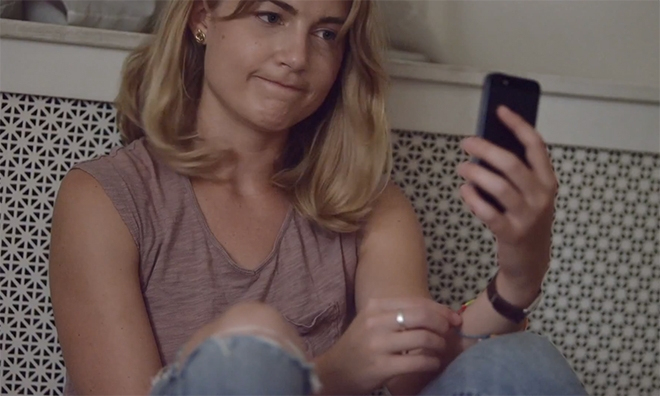 Taking a leaf out of Apple’s own playbook, the spot works on both a functional and an emotional / social level. It points out which of the S2’s features are technically superior to the iPhone’s. Possibly more importantly it pokes fun at Apple fans, trying to paint them as out of date, unquestioning, sheep-like devotees in contrast to the independently minded, forward thinking Samsung user. This theme was continued in the 2012 TVC for the Galaxy S3. The latest commercial for the Galaxy S4 launched in May this year serves up more of the same. But it goes one step further in pushing the idea that only ‘old’ people use iPhones. Sidenote: Samsung Australia has just adopted this strategy. Launched in July, the Australian campaign features a group of Samsung Galaxy carrying hipsters, with the one friend who is still an iPhone user being, of course, the odd man out. May also saw Microsoft follow Samsung’s lead with a series of commercials comparing the capabilities of Windows 8 powered tablets to the iPad. In a turn around on the Get a Mac campaign (which Microsoft no doubt enjoyed signing off on) the spots have an iPad forlornly admiring the superior computing features of a Windows tablet. To cut deeper, the ads parody Apple’s advertising aesthetics with plenty of white space and upbeat music. The use of the voice of Siri, Apple’s virtual assistant, to personify the iPad, adds extra bite to the critique; with the accentuation of its mechanistic tone chipping away at Apple’s human-centred ethos. This concept has just recently been extended to mini-tablets. (Look out for the tongue in cheek reference to Get a Mac’s “And I’m a PC” in the “Wow, you’re a real PC” line). To round things off the Nokia Lumia 920 Windows Phone is attempting to present itself as the ‘in the know’ choice by ridiculing both iPhone and Samsung users. Each spot shows through personal and intimate glimpses how the iPhone touches the lives of people from all walks of life. The campaign is deliberately inclusive in contrast to competitors’ attempts at divisiveness. It is also an appeal to people’s herd instincts. It provides reassurance to existing and prospective customers (who may be confused and swayed by the technical points being made by competitors) that Apple is still the right choice. After all, if more people use an iPhone “than any other phone” then it must be ‘the best’, right? The campaign takes the emotional high ground in the category. But maybe not surprisingly given the mood of the moment, a competitor has taken a direct shot at it. The latest Nokia spot reverts to classic comparative advertising by showing the superior quality of photos taken on a Lumia 925 versus those taken on an iPhone. And it does this while mimicking the look and the language of the Every Day campaign’s ‘Photos Every Day’ spot shown above; going as far as reproducing exact scenes from it. In parallel with the Every Day spots, Apple has launched the Our Signature campaign. Using the tagline “Designed by Apple in California” (which is printed on the box of every Apple product), its focus is the brand’s user-first corporate manifesto. Reports are the campaign hasn’t been a hit with consumers. Various reasons have been suggested for this, ranging from it being self-indulgent and lacking in joy to the view that it’s deliberately blurring the fact that most of Apple’s products are manufactured in China. This has opened the door for the Google-owned Motorola to exploit another avenue of attack. Motorola’s just launched Moto X is the first smartphone to be manufactured in the U.S.A. Its launch campaign understandably communicates this. But it does it in a way that subtly draws attention to Apple’s omission of the “Assembled in China” statement also found on its products. This is achieved via the Moto X tagline “Designed by You. Assembled in the USA.” that mirror’s Apple’s “Designed by Apple in California” in both word choice and font style. Apple’s fall back on its values and purpose is strategically sound for a brand being attacked by competitors on ‘What we do’ and ‘How we do it’ points. Given its long-held ambition to “change the world”, a reversion to a ‘Why we do it’ position – at least for the moment – makes perfect sense. None of its competitors have the credentials to take it on in this space. While the Our Signature campaign may not quite be hitting the mark with the ‘average consumer’, a quick look around the interweb suggests that it’s resonating with Apple loyalists. This may be all it is intended to do. To remind its customers what they love about the brand and spur its acolytes into defending it. As for the broader market, a change to the way the idea is expressed (e.g. with a bit more joy) may be all it takes. On the topic of activating its community of followers, this is an asset that has of its own accord been defending the brand against each competitive incursion. There is no shortage of passionate expert and amateur fans ready to dismantle competitors’ claims and criticisms. Apple itself is famously opaque. It is highly secretive (which tends to drive speculation and conversation), rarely responds to media enquiries and barely uses social media (it doesn’t have an official Facebook or Twitter page). If the brand needs to conduct a prolonged defensive campaign, then proactively arming its community with selected facts and arguments may be a strategy it needs to explore. But ultimately Apple needs to reveal the ‘next big thing’. Having shored up the emotion around the brand, and allowing its social currency to speak for itself, it now has to regain its momentum through product innovation. It is no coincidence that the wave of competitor attack advertising has come during a lean period for new product launches. The Apple promise has always been led by its imaginative, user-friendly technology. It is not simply a story-telling brand, it is a story-doing brand. It is believed that Apple will launch a new iPhone in September, the iPhone 5S with more processing power and memory than the current iPhone 5. A budget version, the iPhone 5C, is also rumoured, as is a gold iPhone (which is causing some consternation amongst brand purists as to date Apple has stayed minimalist and only offered the choice of black or white). There is also speculation about improvements to the iPad and iPad Mini. But at best all these are expected to be evolutionary rather revolutionary. So it looks like it will be 2014 before Apple introduces its next ‘life-changing’ product. Candidates for this are the iWatch and Apple Television. The impacts of these machinations are real and big. Apple has dropped some $260 billion in market capitalization over the past year, with investors concerned that it has lost its innovation and growth impetus with the loss of Steve Jobs. While its most recent quarterly earnings of $35.3 billion are slightly up on the same quarter last year, net profits are down to $6.9 billion from $8.8 billion. This reflects a fall in gross margin of almost 6 percent, from 42.8 percent to 36.9 percent. The continuing quarter on quarter fall in profit margin is what has investors most concerned. It is this backdrop that has competitors smelling blood in the water. Pepsi tried with little success to make Coke the taste of an older generation. Faced with multiple attacks will Apple prove to be as resilient? Can it retain its social cachet? Can Apple keep its cool? After all these years they still don’t get it. Apple sells brands. (Not just awesome products and benefits) Through deep emotional consumer insight identification and dramatisation. The competition still argue about petty product attributes and gadgetry which are nice-to-have but non essential and complexify the Os design and UI for low added value output. Now just you wait until Apple release its low cost handset. I predict a slaughter. Yes it will hurt the margins. But one can’t constantly revolutionise innovation time and time again every year. Not even the late Mr Jobs. Agreed that Apple ‘sells’ a brand while the others are selling products. But the way its products perform and its innovation are also key components of the overall brand story. The emotional connection to the brand is a point of competitive advantage which drives it when its products are better or at parity, and protects at times when they are real or perceived product shortcomings; as seems to be the current situation. The launch of the cheaper iPhone 5C (which has just officially happened) will grow its market share and bring in new customers. In terms of the strategic management of the brand over time its a reasonable strategy. But it will probably have to show real ‘breakthrough’ innovation in 2014 or the innovation pillar of the brand will suffer to its overall detriment. By the way – in keeping with the current ‘attack Apple’ trend covered in the post – Nokia in the UK has already called out Apple for stealing the colours it uses for its phones for the iPhone 5C.